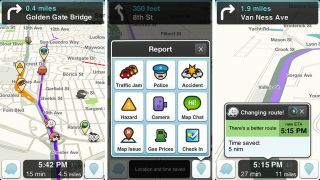 Google's recent purchase of the community-sourced Waze traffic app faces an official probe from the Office of Fair Trading (OFT) on grounds the deal may be breaking competition laws. The search and mobile giant agreed a deal to acquire Israel-based start-up in June, for a reported $1.3 billion (around £0.83m), in order to boost its own Google Maps navigation app. However, the OFT has expressed concern that Google's ownership of the app, which offers real time traffic updates, provides petrol price info and police traps, may give the company too large a slice of the pie. If the OFT finds that Google's purchase gives it more than 25 per cent of the relevant UK market and/or a turnover of more than £70m, then it would have grounds to order divestments. In its announcement, the OFT wrote: "The Office of Fair Trading is considering whether this agreement has resulted in the creation of a relevant merger situation under the merger provisions of the Enterprise Act 2002 and, if so, whether the creation of that situation has resulted, or may be expected to result, in a substantial lessening of competition within any market or markets in the United Kingdom for goods or services." Google has yet to comment on the situation, while the OFT has given interested parties 40 days to weigh in on the debate and have their say. The OFT's announcement follows a similar proclamation from its US counterpart, the Federal Trade Commission, which announced it'd be looking into the legalities of the deal, back in June.